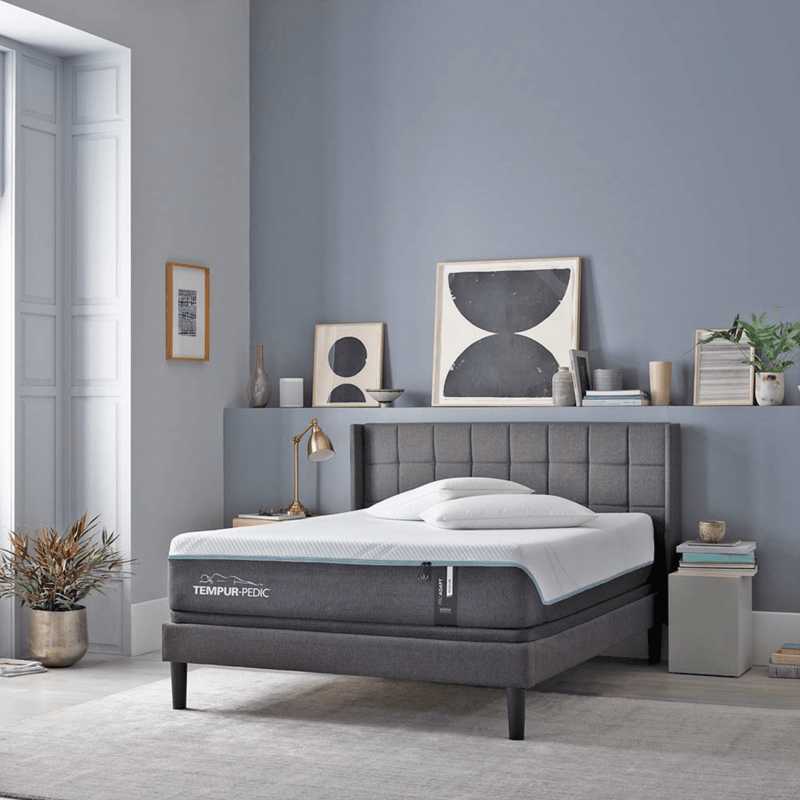 In TEMPUR-Pedic’s 2018 makeover of its product lines, the first step of four was the TEMPUR-Adapt Series, with two models, replacing two existing Pima models in two collections. The second step was the TEMPUR-ProAdapt Series, with four models replacing the Supreme models in three collections. Both of these series were introduced to retailers at the 2018 Winter Market in Las Vegas. Later in the year, they were put up for sale, first TEMPUR-Adapt, then TEMPUR-ProAdapt. Following these was the third step, the TEMPUR-LuxeAdapt Series, introduced at the 2018 Summer Market and released for sale in the Fall. Like all other TEMPUR-Pedic models, these are mattresses made in the USA. This ensures higher quality materials, especially the foams. 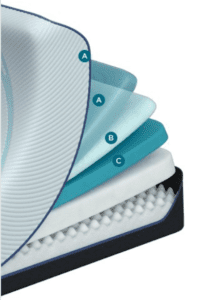 The construction of memory foam mattresses in the TEMPUR-ProAdapt Series is similar to that in the TEMPUR-Adapt Series, but with key differences. The most obvious difference is the height, 11” in Adapt and 12” in ProAdapt. 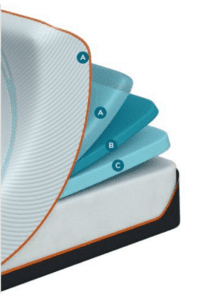 The material differences are the use of TEMPUR-Pedic’s TEMPUR–APR™ Material in the foam layers and the SmartClimate® Dual Cover System on top. Additionally, as can be seen in the table above, there is a greater range of firmness among the models. As is suggested by the name, the SmartClimate® Dual Cover System is two covers in one. The outer top panel is the Cool-to-Touch Cover used on Adapt mattresses. It is zippered so it can be removed for washing. The moisture-wicking fibers are to keep the sleeper cool and dry. The inner cover is a stretch knit for smooth conformity with the top foam layer as it conforms to the sleeper’s contours. This layer and the one beneath determine the firmness of each model. The four models have three Comfort Layer materials. Soft – This is 2” of TEMPUR-ES which was the distinguishing feature of TEMPUR-Cloud mattresses, with its quick conformity, softer feel, and less heat. It is the later version of the 4-lb. 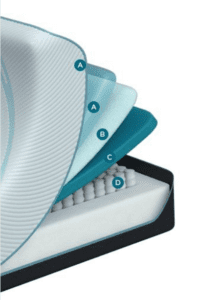 TEMPUR Material developed in response to Dr. Rick Swartzburg’s Tri-Pedic mattress. Medium – This is 2” of Original TEMPUR Material, the 5-lb. visco-elastic foam. It does differ from the original Original material in being open-cell foam – the original was closed-cell foam. This allows air to filter through, making it not as warm. 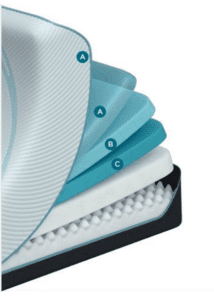 However, there would be more airflow if the foam were perforated, as it is in the Airflow Transfer System used in Snuggle-Pedic and Tempflow mattresses and optional in Selectabed’s mattresses (standard in Flex-Tech). The current Breeze models do have vertical ventilation of the top foams. Medium Hybrid – Like the Soft, the Medium Hybrid has TEMPUR-ES in the comfort layer. Its firmness is midway between the Soft and the Medium. In Hybrid, this layer is 2½” high, making it a bit softer than Medium. Firm – The Comfort Layer in the Firm is 1¼” of TEMPUR-APR™, which is in the Support Layer of the other three models. This puts the firmer foam at the top, giving the mattress an overall firmer feel. In the diagram, it appears to be slightly thinner, as it is in Hybrid’s Support Layer. If so, this lets the Base be thicker, thereby making the mattress firmer. There are two materials in the Support Layers of the four models, with three sharing one material. Soft, Medium, and Medium Hybrid – The Support Layer in each of these models is TEMPUR-APR™, a new material by TEMPUR-Pedic. It is described by the company as “Our most pressure-relieving material ever — made for deeper, more rejuvenating sleep.” Another version of this material, TEMPUR-APR+™, is used in the TEMPUR-LuxeAdapt Series. This layer is 2” thick in Soft and Medium, and thinner (1⅓”) in the Medium Hybrid. Firm – This model uses 2” of Original TEMPUR Material in the Support Layer. This is the reversal of the materials in the Medium, suggesting that the APR is firmer than the 5-lb. original TEMPUR Foam. 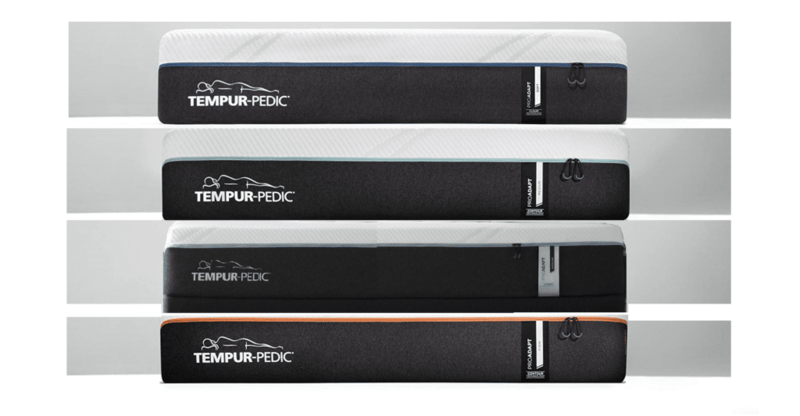 The TEMPUR-HD material used in the TEMPUR-Contour mattresses has a 7-lbs/in³ density. Three bases are used in the four TEMPUR-ProAdapt models, at least in composition. Soft and Medium – The 8” base in these two models consists of two HD polyurethane foam layers of almost equal height. The top surface of the lower layer is convoluted. The purpose of this convolution is not explained in the descriptions. It is hard to see how this would help with cooling – there is no hint of perforation in the upper layer to let air flow through. One obvious effect is that this reduces the firmness of the Base, softening the feel of the mattress slightly. Medium Hybrid – The 8” high base of the ProAdapt Medium Hybrid is an array of over 1,000 pocket coils surrounded by a foam rail and sitting on an extra firm base pad. The coils give the mattress a springy feel users of innerspring mattresses are familiar with. At the same time, pocket coils are conforming, adding to pressure relief. Firm – The base of the ProAdapt Firm mattress is a single 8¾” high block of HD polyurethane. The higher, solid block Base alone would make this model a bit firmer, with a gain in firmness from not having the convoluted surface in the middle. Memory foam mattresses in the TEMPUR-ProAdapt Series show the imaginative innovation of TEMPUR-Pedic’s engineers, both in materials development and in how these materials are used. Attempts are made to make the mattresses cooler than past models have been. More effective cooling will come with the updated Breeze mattresses in the last step of the transformation. Most of the customer reviews for the TEMPUR-ProAdapt Series are on the TEMPUR-Pedic website: 260 (as of this writing) compared to 20 on Amazon and 19 on GoodBed (more than ten times as many). This is not surprising, since most TEMPUR-Pedic mattresses are sold in stores, and the best place for customers to air their views is on the manufacturer’s site. The reviews are collected and verified by PowerReviews to guarantee they are from genuine customers. On Amazon, the reviews for the entire series are shown together, while PowerReviews shows the model each reviewer has, making it possible to rate each model separately. This also indicates which models sell better. However, since this line has only been on the market for about half a year, the mattresses have not been in service long enough to see how they hold up over time. Medium is the best selling TEMPUR-ProAdapt model followed by Firm. Soft appears to be have the least sold, but it has only four fewer reviews than Medium Hybrid. The highest rated model is the Firm, followed by Soft. Medium has the lowest average rating, a very respectable 4.51 (over 90%). Coincidentally, Medium hybrid has the same average rating as the series as a whole. With ratings over 90%, one expects mostly pros and very few cons. However, even in a 5-star review, a customer can state one con.